Here at Tableau, we work to help you maximize the impact of your data no matter the location or format. And we’re thrilled to share we’ve reached a milestone: Tableau now has 60 instant connectors. You just click, enter your credentials—no complicated programming needed—and on to analyzing all that data! We didn’t let 2016 end without adding two more data sources: an Anaplan connector for business planning data, and an Eloqua connector for marketing automation and campaign data. These applications help customers in finance and marketing teams see and understand data highly relevant to them. For example, Anaplan is used in many companies for forecasting and purchasing. A finance manager can easily bring that data into Tableau using the live connection and perform integrated business planning across various functions in real-time. In our upcoming release, we’re adding direct connections to Apache Drill and Microsoft SharePoint lists. Check out our Coming Soon page to learn more. Our connector offerings span the entire data landscape. You can connect directly to relational databases, semistructured data like JSON, cloud databases like Amazon Redshift and Snowflake, and cloud applications like Salesforce and Google Analytics. You also can connect to any web data like Twitter, Facebook, or even Spotify with the Web Data Connector. For most data connectors, all you need are your login credentials so you can spend your time answering questions, not wrangling your data. We’re always working to build additional direct connectors to help you leverage all of your data instantly. 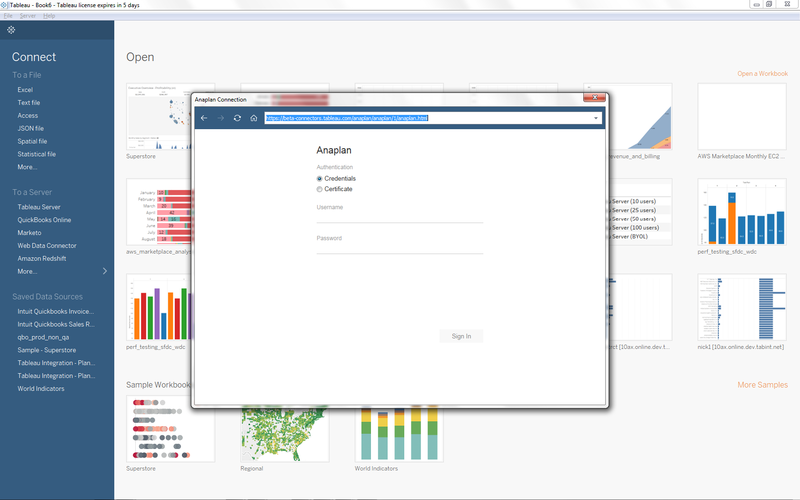 To get access to the latest Tableau’s data connectors, make sure you have upgrade to the latest version. Visit our Coming Soon page to learn about all the features we're planning for Tableau 10.2. Try out all the new features in this post, and many more coming to Tableau Desktop, by signing up for Tableau’s beta program.